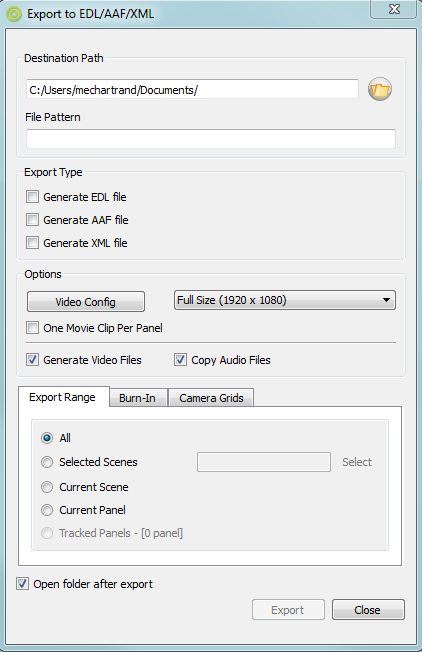 Once a storyboard is done, there are several reasons to send it to a Non Linear Editing (NLE) system. It could be to complete the animatic in a real editing suite with a direct return on TV, or it could be to use it as a pre-editing map to replace the storyboard scenes with the final materials (shot in live action or rendered from a 2D or 3D software). It is possible to export your storyboard project, and preserve the timing, motions and sounds edited with Storyboard Pro, directly to Apple Final Cut Pro using EDL or XML formats or to Adobe Premiere, Avid Xpress, or Sony Vegas using AAF format. It is possible to define sequential file name patterns when exporting to Image Sequence, Bitmap, EDL, and AAF (movie files). The number in-between represents the minimum length to display it. If the text-value is shorter than this length, it will be left-padded by 0 (zero). %1f = you will see "48" in file name. %2f = you will see "48" in file name. %3f = you will see "048" in file name. %4f = you will see "0048" in file name. This section will explain how to export your storyboard in EDL or AAF format, then how to import your project into a major NLE system. NOTE: Refer to the third party software’s user guide to learn how to import and use the EDL/AAF/XML file.